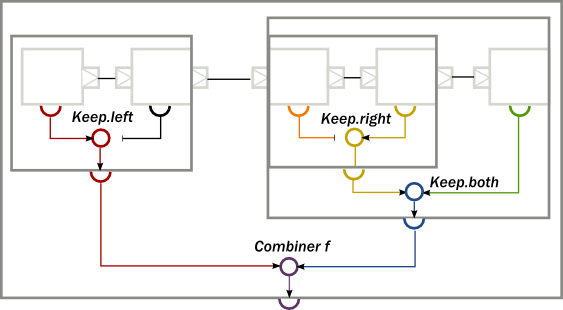 I think the idea is quite obvious: a single string value goes from its Source through a mapping stage Flow[String].map and ends up in a Sink that printlns its input. However, if we execute this code, nothing will be printed. Here lies the border between streams description and streams execution in Akka Streams. We have just created a RunnableGraph, which is kind of a blueprint, and any other (arbitrary complex) streams are only blueprints as well. To execute, materialize (in Akka Streams’ terms) them, we need a Materializer — a special tool that actually runs streams, it allocates all resources that are necessary and starts all the mechanics. It is theoretically possible to have any kind of Materializer, but out of the box, the library includes only one, ActorMaterializer. It executes stream stages on top of Akka actors. It will print HELLO WORLD to the console. We can do this as many times as we like, the result will be the same — blueprints are immutable. Check Overview of built-in stages and their semantics page in the documentation. I just added the val with a type NotUsed, the same NotUsed we just have seen as a type parameter of the RunnableGraph earlier. As we can see, the value of this type has been created and returned during the materialization — any materialization. Run a stream five times — get five materialized values, completely independent. 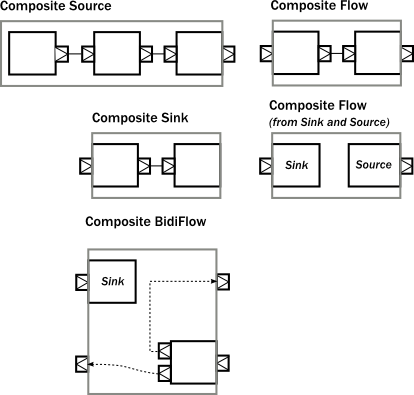 Materialized values (and their type) originate in a Source and are propagated through all stages of a stream to a Sink. We can modify this behaviour and create other materialized values. Here we replaced to with toMat. toMat allows a materialized value provided by a Sink to be used. In this case, the materialized value of Sink.foreach is Future[Done], a Future that completes with Success[Done] when a stream finishes (its materialization, to be precise) successfully, and with Failure when it fails. Done is just a signalling object that brings no information inside. We can think of materialized values as of some kind of external handler to a materialized stream. toMat takes additional parameter combine, a function that combines two materialized values: one from the previous stage and one from the current stages. There are four predefined functions: Keep.left (used by default, check the implementation), Keep.right, Keep.both and Keep.none. It is, of course, possible to use a custom function with arbitrary combining logic. The new thing here is viaMat, which is a full version of via (in the same way as toMat is a full version of to), which gives more control of materialized values. And a stage we added is KillSwitches.single, which just creates a kill switch per materialization (not shared between materializations) as its materialized values. We use Keep.right to preserve it and pass downstream, and Keep.both to preserve both KillSwitch and Future[Done]. In real-world systems, it is not uncommon that a producer of data is faster than a consumer at some point of the data processing pipeline. In this case, there are several ways to deal with this. 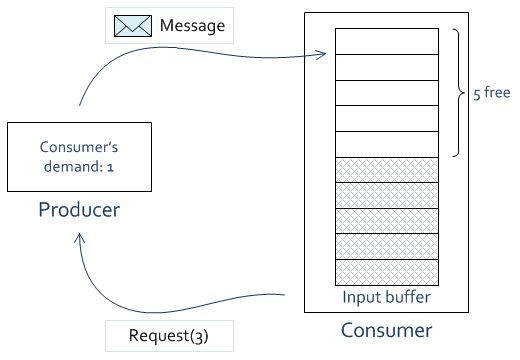 First, we can buffer incoming data on the consumer side, but this leads to memory consumption problems (including out-of-memory errors) if the consumer is consistently slower and the data is big enough. Second, we can drop messages on the consumer side, which, of course, is not always acceptable. There is a technique called back pressure which idea is basically in providing a mechanism for consumers to signal to producers of how much data they can accept at the moment. This might be done in a form of NACK, negative acknowledgement (when the consumer denies to receive a piece of data and signals to the producer about this), or in a form of requests (when the consumer explicitly tells the producer how much data it is ready to accept). Akka Streams adheres to the second option. Users of Akka Streams rarely see this back pressure mechanics. 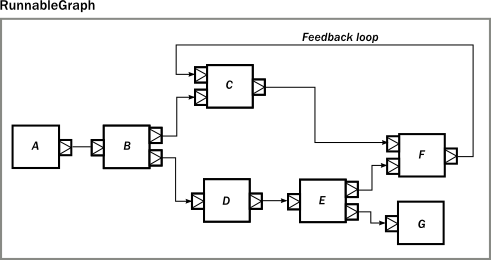 However, you can explicitly control it while implementing your own stages. For instance, if a Source is made of an actor, the actor will receive Request(n: Long) messages, which means “I am ready to receive n more elements”. The producer had previously accumulated the consumer’s demand of 2. It has just sent one message, so the demand decreased from 2 to 1. Meanwhile, the consumer has sent a request for another 3 messages. The consumer’s demand accumulated in the producer and will increase by 3 when the request arrives. In this case, up to 100 elements will be collected, and on the arrival of 101, the youngest element will be dropped. There are some more strategies: dropHead (like dropTail but drops the oldest element), dropBuffer (drop the whole buffer), dropNew (drop the element just came), backpressure (normal back pressure), fail (fails the stream). I have been using Akka Streams quite intensively over the last few months. One of the tasks was to consume events from Nakadi (a RESTful API to a distributed Kafka-like event bus), store them in AWS DynamoDB, send them to AWS SQS, and save a just-processed event offset in DynamoDB as well. newer events have higher priority than older. Nakadi provides RESTful API, i.e. can be used through HTTP. It responses with an infinite HTTP response with one event batch in JSON format per line (application/stream+json). Akka HTTP — another part of Akka — is tightly integrated with Akka Streams. It uses Akka Streams for sending and processing HTTP requests. // Coalesce chunks into a line. What is interesting here is that dynamoDBEventsWriter is only a tiny wrapper around Amazon’s DynamoDB driver for Java, which does blocking I/O. We do not want to block in our data processing pipeline (otherwise, no HTTP I/O or other things while writing to DynamoDB). This is why this stage is made asynchronous (.async) and attached to a specific Akka dispatcher, dedicated for blocking I/O operations with DynamoDB. Feel the Power! The other stages are pretty much the same. You can find more information about asynchronous stages in the documentation (here and here), and in Threading & Concurrency in Akka Streams Explained (part I) blog post. Basically, processing of events amounts to the materialization of this stream. Naturally, in the real production application this is more complex due to configurability of the pipeline itself, the code also includes monitoring, error recovery, etc. For the details you can consult the documentation here and here (where the illustration is taken from). Despite the abundance of out-of-the box processing stages in Akka Streams, it is not impossible or uncommon to write your own. It is a really broad topic, so I will not go into it. You can check this post in Akka blog and the links to other posts inside it. It gives pretty good explanation of creating custom stages. Plus Custom stream processing page in the documentation. There are other possibilities, too — instead of creating a new actor, send messages to an existing one (with or without acknowledgements). In this article I have tried to cover the very basics of Akka Streams. This (and the whole field of asynchronous data processing pipelines) is a very big and interesting topic which you can delve into. Perhaps, the biggest and the most comprehensive guide is the official documentation, which I referred to before. Do not ignore Akka blog that is mostly about Streams. Also there are plenty of conference videos on the internet (just search on YouTube), like Akka Streams & Reactive Streams in Action by Konrad Malawski. There are many other streaming libraries, and I must mention Reactive Extensions here. It is implemented for many platforms including JVM, .NET, Android, JS, etc. I am interested in the real-world applications of the library — and generally in asynchronous data processing pipelines, so if you use it, drop a couple of lines in the comments.